Watch out—this one will sting! And don't expect any honey from this busy bee; she's made of pure poison. 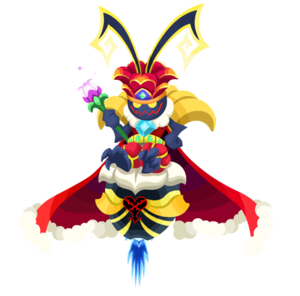 The Queen Bee is an Emblem Heartless that was introduced in Kingdom Hearts χ during the Honey event in 2015 and in Kingdom Hearts Union χ during the 2016 Zootopia Raid Boss event. This page was last edited on 3 April 2019, at 18:32.